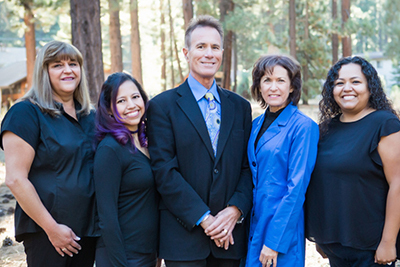 Dental Crowns – Tahoe Family Dentists - Providing excellence in dentistry in South Lake Tahoe. A crown can restore function and looks to your smile, strengthening and protecting teeth from damage or decay. If you have a tooth that is cracked, has had root canal therapy, is chipped, has a deep cavity, or has lost an old filling, a crown may be the best option for you. 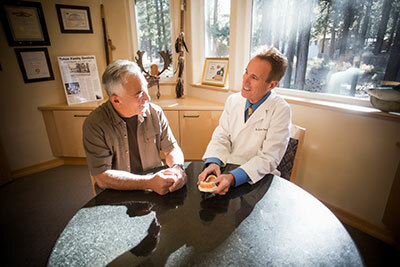 Our South Lake Tahoe dental office places hundreds of crowns each year, to restore damaged or decayed teeth and give patients back the carefree smiles they deserve. A crown is designed to replace the damaged chewing surface of a back tooth, providing strength, durability, and cosmetic restoration. A crown is cemented over the remaining exposed surface of a treated tooth, covering the area above the gum line. Crowns can be created from porcelain, precious metal, or a combination of materials. Porcelain is often favored since it is strong, durable, translucent, and can be crafted to look like the patient’s original tooth. A crown can restore function and aesthetics to your smile, and provide a way to strengthen your tooth and protect it against further damage or decay. Crown installation takes place over two appointments at our South Lake Tahoe dentist’s office. At your first appointment, the tooth to be crowned is shaped and prepared to accept the crown, and an impression will be made of that section of the mouth. A temporary generic crown will be installed while the permanent crown is being made. Your customized crown will be fabricated at the dental lab. The crown will be carefully created to match the color and shape of your existing teeth as closely as possible. At the second appointment, the temporary crown will be removed, and the permanent installation completed. Your chewing ability and a proper bite will be restored. If you need to find out if a crown is the right dental restoration for you, please call our office at 530-541-1353 to schedule an appointment!